Meet our new furry friend, Duncan! 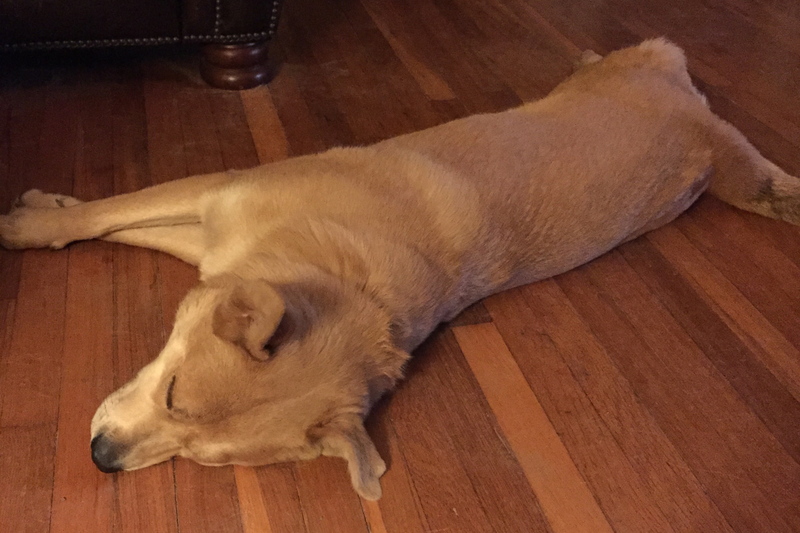 He’s a shepherd mix, about 15 months old and 78 pounds (or so they said. He doesn’t seem that heavy, but he is solid). We met several dogs over the last week or so, trying to find our newest pupper, and none of the were just right. 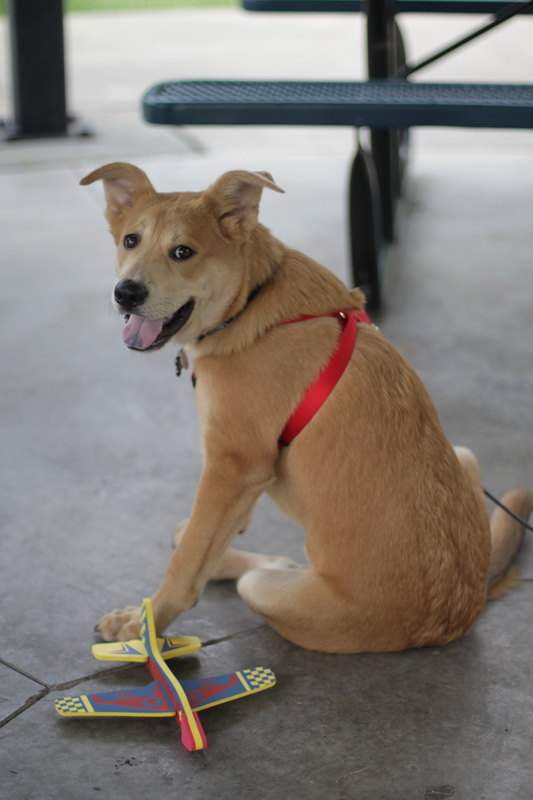 Duncan was a great mix of cuteness, playfulness, and respectfulness. They all three seem to get along well, and Duncan backs off every time one of the others corrects him, which is a great sign. He runs around the yard with Grace, which she loves, and he roughhouses with Jack, so I think this might work out well. (Fingers crossed!) He doesn’t have great manners all the time so we’ll be working on that, but seems willing to learn. 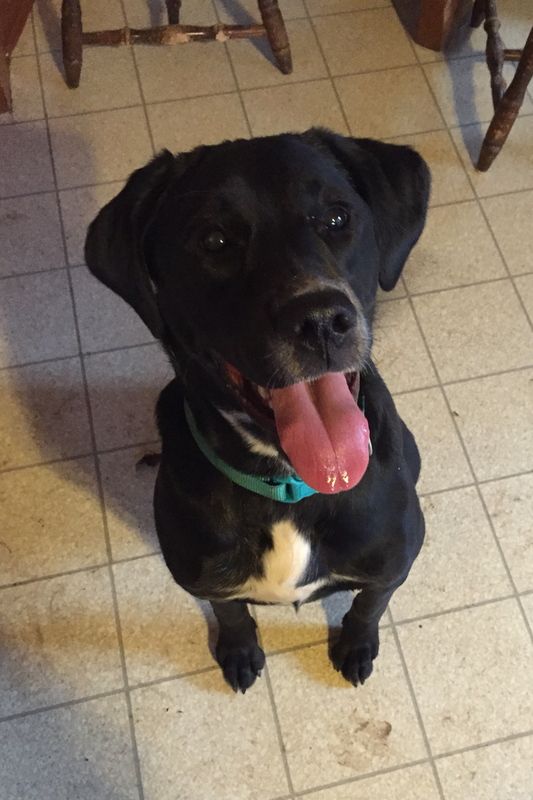 Duncan was adopted from the Great Plains SPCA, and they were super helpful in our search. But in the KC metro area, you can also find lots of furry friends at Wayside Waifs and KC Pet Project. I’m a big advocate of Adopt, Don’t Shop! 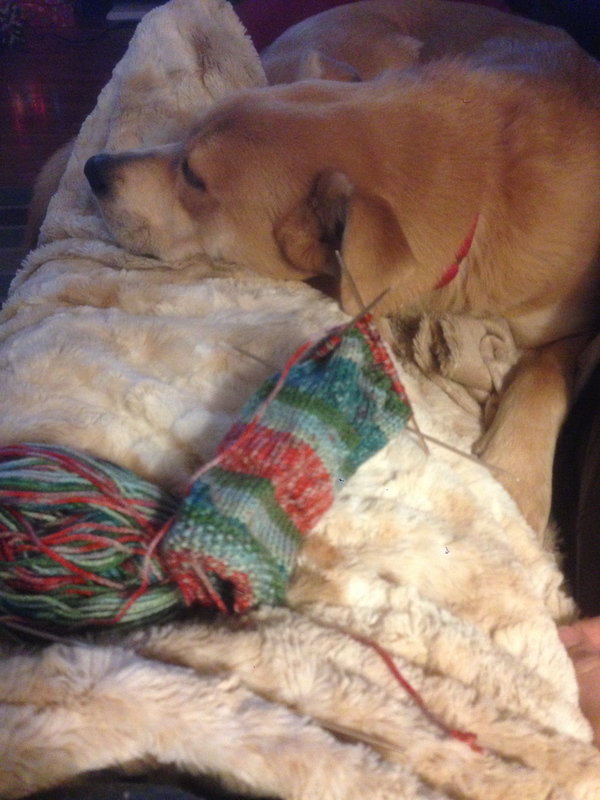 There has been a bit of knitting here and there too. I finished the set I’m donating to a silent auction fundraiser and I think it turned out pretty cute. I used the visual element of the Twinkly Lights cowl and combined it with the Zig Zag Chevron hat and the 75 Yard Malabrigo Mitts. Hopefully someone likes it enough to bid on it! No knitting photos today: I didn’t make enough progress on anything yesterday. So instead I’ll share some dog photos, because dogs. 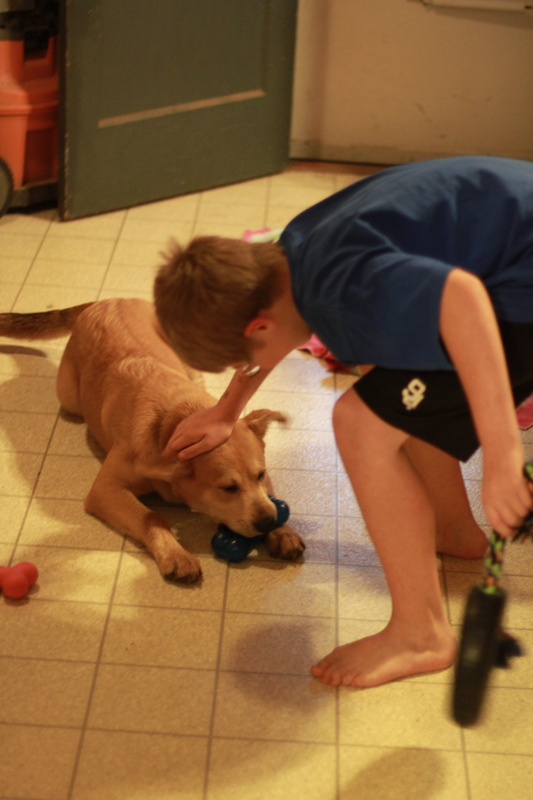 Yesterday was Jack’s Gotcha day: two years since we adopted him from Wayside Waifs, one of the local animal shelters. He’s been a treat since day one. He is my baby, my constant companion, my protector. He is absolutely the perfect dog for me. I could add a ton more cute photos but you’ve seen most of them. We got our new puppy yesterday! I got tired of waiting to hear from the volunteer-run rescue shelter place, so we drove out to the Great Plains SPCA just to see if anyone caught our eye. We made it all the way through before this little black Lab looked up at us. All the other dogs were barking and she was just watching us. She had this pretty white streak on her chest and little white socks on her back paws. She was a little over nine months old, young like we were looking for, and seemed friendly enough. We arranged for a meeting and she was bouncy and playful and affectionate, and it didn’t take long for us to decide we needed to bring Jack up to meet her. The meeting went well, though they didn’t play immediately like I was expecting. She was a little more aggressive than he was, and he didn’t appreciate her nose going where it went. But they didn’t dislike each other, little growling, no hackles raised, so we figured what the heck, and brought her home. Her name is Grace, and she’s 59 pounds of sweet sass. She’s not quite 10 months old yet so they expect her to get a little bigger. Right now she’s about as tall and long as Jack is, but he’s much stockier. She seems lean and streamlined compared to him. 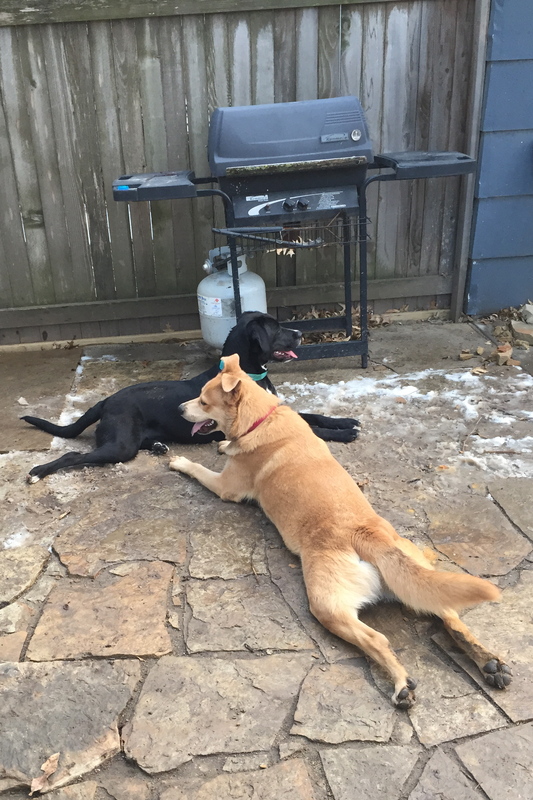 As soon as we got them in the backyard together, they started wrestling, and pretty much haven’t stopped. They’ll take a five-minute break and then they’re back at it. I love that they’re getting along so well, but I had no idea how much space two crazy puppies would take up! Three dogs? Fuhgeddaboudit! But these two seem to be having a ball, so I can handle it. I kind of wish they’d chill out a little bit now and then, but it’ll happen eventually.The best news for me was that they did fine overnight together. Jack has a bed in the kitchen, so we put another bed in there for Gracie, and after a few thumps, it was quiet all night. I woke up to two very bouncy, happy puppies. And a puddle too, but hopefully that won’t last long. She grasps the concept; I think Jack just needs to leave her alone long enough to let her pee when they’re outside. Really, it’s going better than I expected. 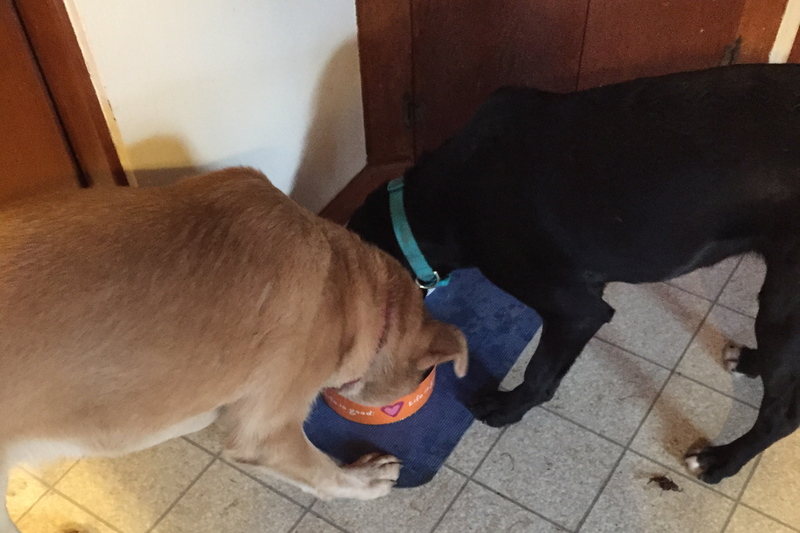 I know there’ll be some tension over toys and sticks, but they had breakfast in the same room without too much trouble. The only sad part is that I seem to have lost my cuddle puppy. He won’t lie on the couch with me and when I got up, he didn’t even roll over and ask for his ten-minute belly rub. That’ll come back, right? I sure hope so! And they do wear each other out, that’s for sure! This is Jack last night after three hours of almost non-stop wrestling: It’s been an adventure already, and I think we’re in for a lot more. I’ve got more dirt and noise than I had before, but I’ve also got a lot of sweet moments. If you’re thinking about a new furry friend, please check out your local animal shelters first. There are a lot of wonderful dogs out there, and mixed-breeds can be just as fantastic (if not more so) than a pure-bred with papers. 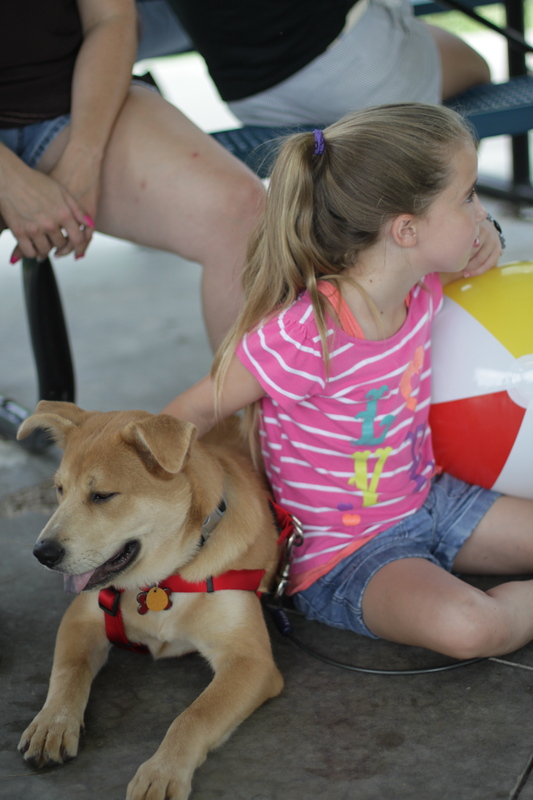 In the Kansas City Metro Area we have three big ones: Wayside Waifs, Great Plains SPCA and the KC Pet Project. I have been distracted from my knitting the last few days. The only thing I’ve completed is a simple ribbed hat that my son requested. I do have a new project on the needles and another that I’m about ready to cast on, but it hasn’t been in the front of my mind. See, I want a dog. Another dog. I have a fabulous puppy named Captain Jack. 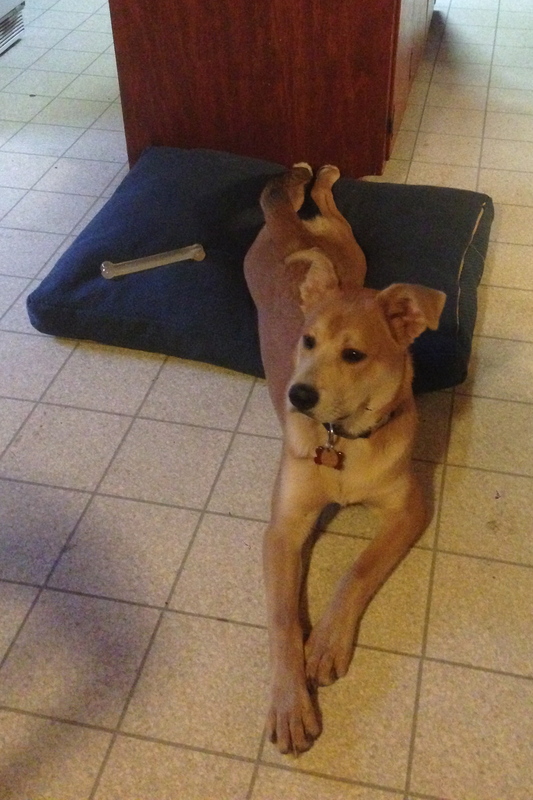 He’s a shepherd mix, just a little over a year old, and he loves to play. Of course we like to play with him, but we’ve decided we’d like him to have a sibling. A couple of weeks ago, a friend of mine decided she needed to rehome her Siberian Husky, and I got all excited. I love huskies; I think they’re gorgeous and sweet. So I talked my husband into meeting her. (And it was HARD too! He really thought he wasn’t ready for another dog. He was wrong.) We went out there with Jack … and it was a failure. She was bossy and aggressive with him, guarded her water and wouldn’t let him drink, and he wanted nothing to do with her. I’ve seen him with lots of other dogs and he’s never responded that way before. He always tries to get the other dog to play with him. My gut said she wasn’t the right dog for us. 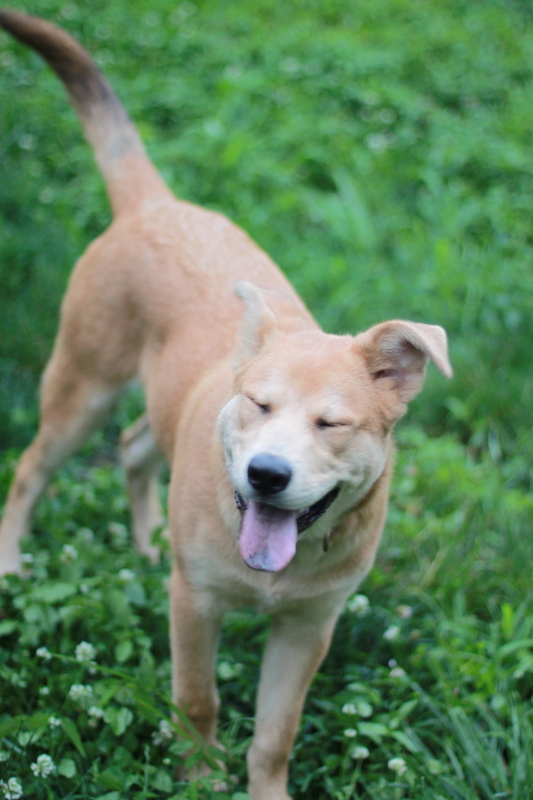 I started browsing the local shelter websites and it didn’t take long before I fell in love with the picture of a goofy-looking Chow mix. I wasn’t sure whether my husband had come to terms with the fact that he wanted another dog, so I didn’t do anything for a week. By the time we went to visit this dog on Valentine’s Day, he was on hold. Oh, we met him, and he was fabulous. Gorgeous and sweet and funny-looking, and so strong and playful. We put our name next on the list, but he was adopted that night. 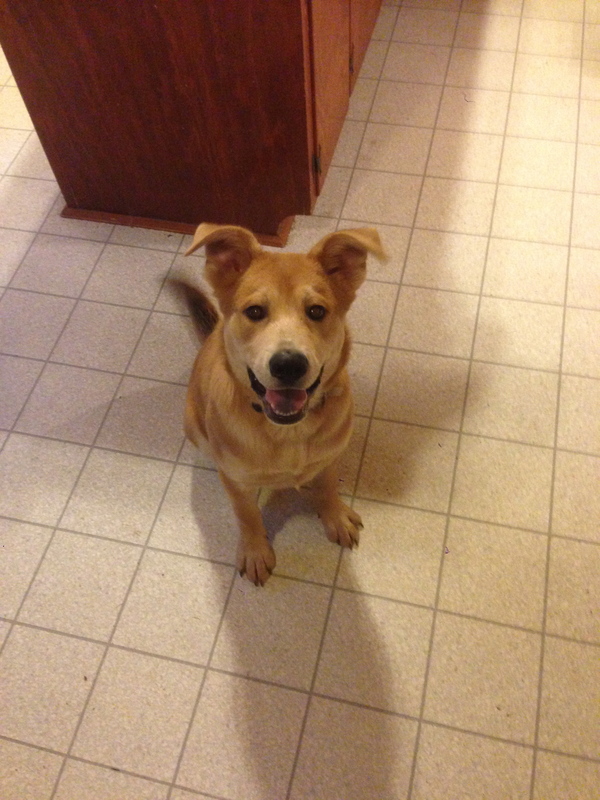 Moving on, I found a shepherd/Shar Pei mix at a smaller shelter. I filled out the application and waited, only to find out that he too had JUST been adopted after having been at the shelter for over a year. Okay. There were two fun, young dogs at yet another shelter, and one was another Shar Pei mix with a delightful squishy face. Another application filled out, and another reply that both the dogs I liked had applications pending. Not quite a firm No, but not too optimistic either. I let them know I’d love to be second on the list. Now I’m waiting. 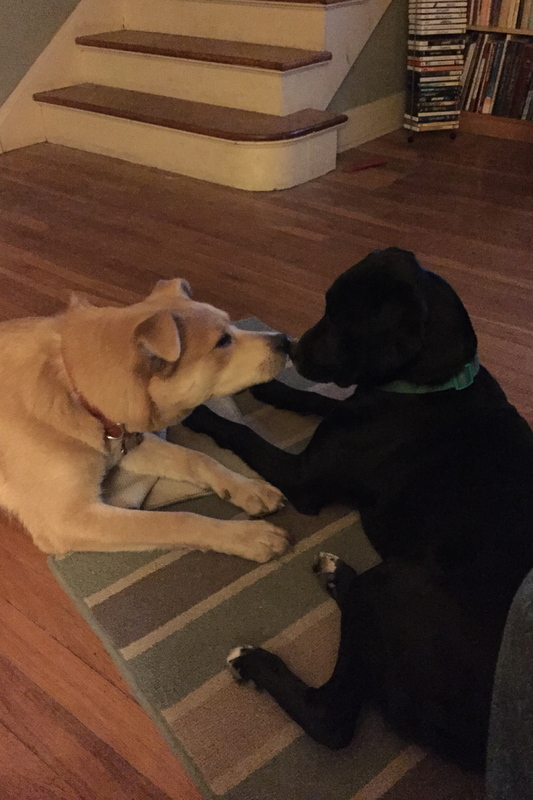 This morning I found two beautiful gray/black shepherd mixes at a volunteer-run shelter right by my house. They’re both male, around 8 months old, and they’re litter mates. I showed them to my husband and he really likes them too, which never happens. He usually has to meet them before expressing any interest. This was another extensive application, and they do a vet reference check before contacting you, so I’m waiting. And I think while I’m waiting I would do well to stop looking at dogs. I would really love one (or both??) of these dogs to be Jack’s new playmate. So if you feel like it, send me some good juju, okay? I would appreciate it! And next time I’ll share some knitting-type stuff too. I was never a Dog Person. We had tons of pets when I was growing up, but I always preferred the cats to the dogs. Cats were soft and fluffy, cuddly and cute. Dogs were big and messy, noisy and smelly. When my husband and I got married and rented our first house, I was so happy to bring my cats from home to live with us. After that last year of college, they moved with us to an apartment, then to our family home. I liked cats. I was a cat person. But I tried to be a dog person. After we bought our house, my parents gave us their dog. They were moving and didn’t have a fenced yard, which we did. So we got a big white husky-type mix named Quincy. He was sweet, if stupid, but he had a habit of pooping inside, and he loved to escape. We tolerated it. But then our first baby was born, and suddenly I had a dog following me around as I tried to take care of this fussy, colicky, screaming child. My patience was limited. I couldn’t deal with both, and I confess we gave the dog back to my parents after they’d fenced their yard. Life was simpler with just the cats. Then my favorite cat died, poor Sasha. I was pregnant with my second child at the time, and the hormones got the best of me. We quickly adopted another Himalayan who we named George. Several months later, we found out our firstborn is allergic to cats. We helped George find a good new home, but the other cat, Beeper, was old. He was my cat. Katie’s allergies weren’t severe enough to warrant rehoming him immediately, so we decided to make it work, and we just wouldn’t get any more cats once Beeper was gone. He made it to 17 years old, poor thing, before his body started giving out in all sorts of ways. I hated to say goodbye but had to do it. We were pet-free. Somehow we never even considered getting a dog, even though nobody was allergic. We weren’t dog people. Since we couldn’t be cat people, we’d be pet-free people. And in some ways, it was really nice. The house stayed cleaner and smelled better. We could have leather couches without worrying about claws. We didn’t have to clean litter boxes. We had a bit of extra money. We could travel without care. Yes, I could do this just fine! Then my dad, who was living in Arizona, got sick. After a few months, it became clear that he wouldn’t be able to keep taking care of his dog. Samson was a huge red husky mix around nine years old. He was docile, gentle, and friendly. I liked him. I didn’t love him, but I liked him. Enough that I didn’t want to see him go to strangers. Maybe more importantly, I loved my dad enough that I wanted to take care of his beloved dog. So Samson came home with us. We had Samson for almost two years. Tomorrow it will be a year since we lost him, and tomorrow I’ll tell you his story. That’s what I started to do today, but this post is already too long. I guess the point today is that Samson turned me into a Dog Person. After we lost him, I really thought we would go back to being pet-free people. I donated or gave away all the dog supplies immediately. Samson was special and irreplaceable, and the only reason we had him was to to please my dad. Why would we ever get another animal? But the house seemed so quiet and empty. I would come home and look in the kitchen door expecting to see a furry smile. I got up in the morning and the kitchen was colder without a soft dog to welcome me. The squirrels ran around our yard happily without a big brown dog chasing them. The snow fell and I couldn’t watch him frolic in it. I didn’t like it. I lasted four months. It probably only took so long because I had to convince my husband he was ready for another dog. The kids were always ready, of course. So we scoured the animal shelters until we found our dog. We’ve had some struggles and some issues, but they’re worth it. Now I’ve got a sweet dog who snuggles on the couch with me, who plays with my son, who goes on walks with my daughter and on runs with my husband. He fills different needs for all of us, except one: that need to share unconditional love. And there’s no animal better at that than dogs. Yes, I’m a Dog Person now. Thanks, Samson, and thanks, Daddy. I’ve said it before and will keep saying it: if you’re wanting a new furry friend, please be sure to visit your local animals shelter(s). There are so many wonderful animals needing homes! Jack is settling in quite nicely! We bought this bed for Max, who never stepped foot on it. Jack has no such qualms: he sleeps on it, runs and slides on it, and even tugs on it when I try to push it back in place. Thankfully, he appears to be housetrained. We had two accidents the day he came home, but nothing since then. He even makes it overnight without accidents. To encourage a good relationship between Jack and the 10yo (David), we’ve given David the job of feeding him, and that’s going very well. Jack is learning to sit and stay while David gets it ready for him. Of course Jack is still a puppy, so there is some nipping and jumping going on, but it’s so obvious the intent is playful that it’s not scary. It is a bit disconcerting when he barrels down the stairs toward me, though the grin on his face makes me laugh. Sure, we’re discouraging it, but you can’t miss his exuberant joy in everything he does. When he sees us, his whole body wags. And he tries so hard to be good: he comes and leans so hard against your legs, curling around you and soaking in all the love you can give him. Then when he gets it, he gets all bouncy and jumpy. “You like me! You really like me!” He’s like a three-year-old in a way, because they live life so fully. They’re still so curious and excited about everything and they can’t always contain their joy and excitement. He’s not so good at playing fetch yet but he does love the yard. He runs hard, his eyes rolling back a little so he gets a crazy look on his face. He snuffles around in the dirt and finds sticks to gnaw on, and it’s adorable when he starts chasing butterflies. 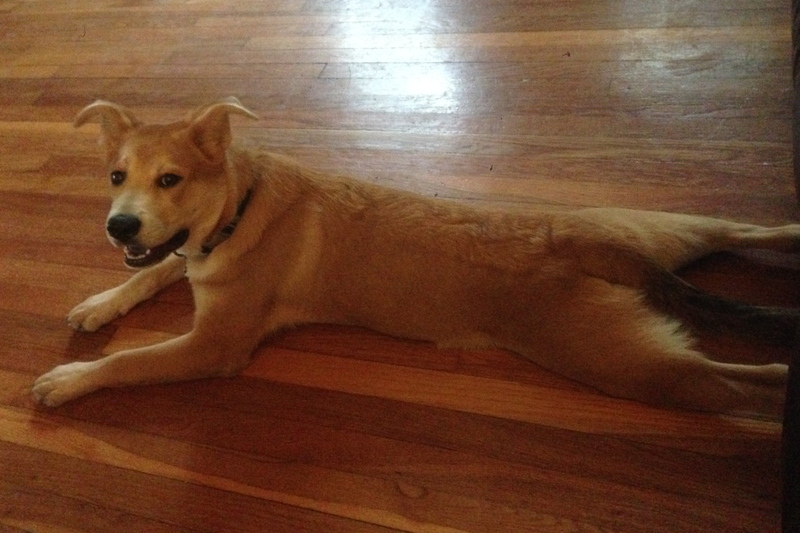 But probably the cutest thing he does is lie down with his legs out behind him. He does it all the time, then scrabbles around when he wants to move or get up. Maybe he likes the cool wood floor against his belly? I’m not sure, but we all hope he doesn’t grow out of it anytime soon. But of all the things I love about Jack, the thing I love the most is his friendly attitude. We took him with us to an outdoor birthday party with about twenty family members, including four young kids. I think he did fine. We’re hoping to start a training class soon, and he’s shown signs of being a quick learner. I’m looking forward to a lot of years of joy with Captain Jack! We’ve had some bad luck with dogs the last year or so. I’ve posted about our Siberian Husky, Max, recently, and the latest update is not great: he has serious resource guarding issues and we were unable to curb his biting. It was more than playful mouthing; this was serious biting of all of us. Considering I have two children of my own, and several younger kids in our family, Max was a huge risk that I could no longer afford to take. The guarding was made worse by the fact that he considered everything food, and paper and socks were huge temptations for him. We tried very hard to help Max but we just weren’t the right family for him. He is now back in the shelter where I’m sure he will find someone who is able to work with him and love him. After that, we all knew we wanted a dog in our family, we just weren’t sure when. We took a vacation, vowing to take some time to think about it and really look for the right dog this time. Well, I’m not good at that. I was ready to get a dog the day we came home. It wasn’t unanimous though so I pretended to be patient while I pored over the dogs at Wayside Waifs and Great Plains SPCA and the Kansas City Pet Project. There are so many awesome animals that need homes! I looked for dogs with good demeanors, ones that were recommended for homes with kids. We weren’t particular about looks or breeds, we just wanted a friendly dog that could safely be around the whole family. Finally, this weekend, we all agreed it was time to go meet some pups. I picked out several options, and we started at the Great Plains SPCA in Merriam. One of the dogs I liked was on hold to be adopted and the other two were in a different location, so instead we met one we liked there. 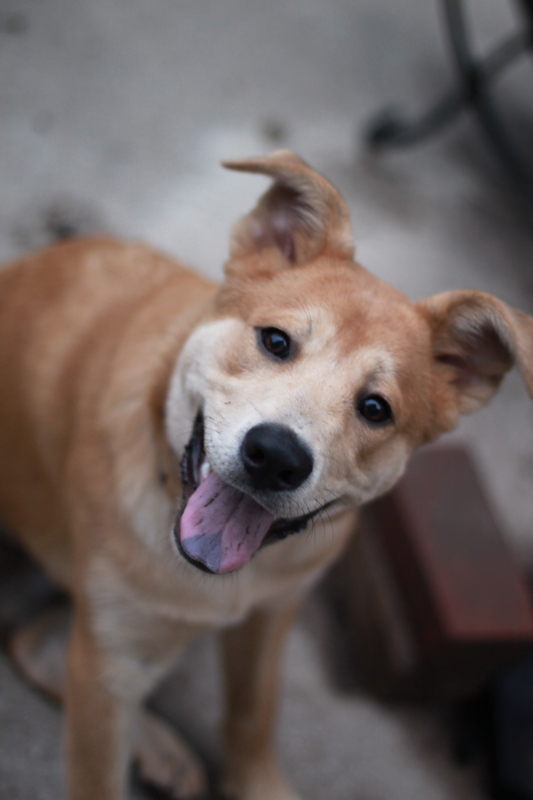 Roxy was a young shepherd mix with tons of energy. She wanted to PLAY! But she was super strong already, and managed to knock the boy over just playing. He clearly wasn’t comfortable around her, so we moved on. We met Cookie Monster next. He was older, around 4, and really mellow, and my son loved how calm he was. Cookie has a sweet face too. But I really wanted a dog with more energy. I wanted a playmate, one that would play ball in the yard and go on walks. Back in the car we went, this time headed to Wayside. There were three dogs on my list there, so I was cautiously optimistic. We saw Barrel first. 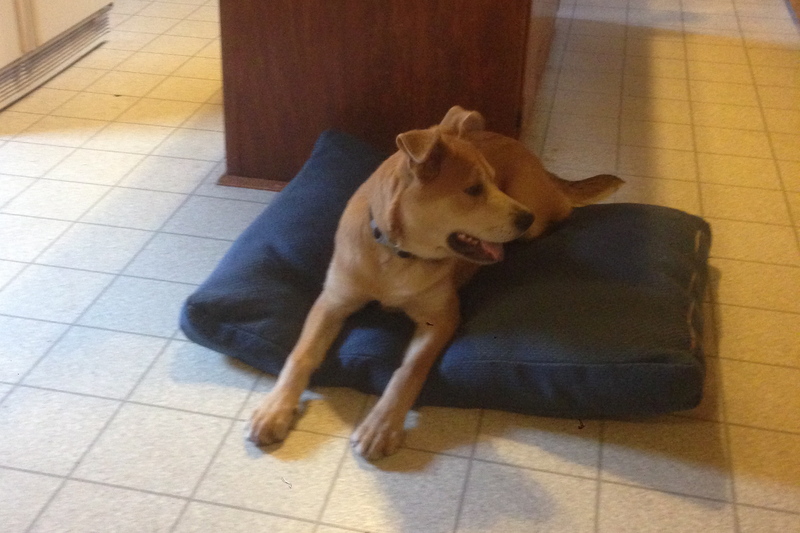 He was another young Shepherd mix who would probably need some obedience training but otherwise would be okay with kids. He has a great face. Kody was next, an older Husky-Lab mix. He’s five and I thought he’d be calm. Finally, we came to Biff Barker. He was on my list but at the bottom, partly because of his age (only five months) and partly because his face in the pictures just didn’t speak to me. Well, when we saw him in person, I think we were all in love. He’s just the cutest darn thing. Oh, we all pretended. We said we’d meet all three dogs and make a decision then. Yeah right. We met Biff first and he was fabulous. My husband sat down and Biff came over and gave him a hug and a kiss and I could see my husband melt right there. He played with all of us, had a gentle mouth with the treats, responded (somewhat) to commands. He was bouncy and energetic and just perfect. 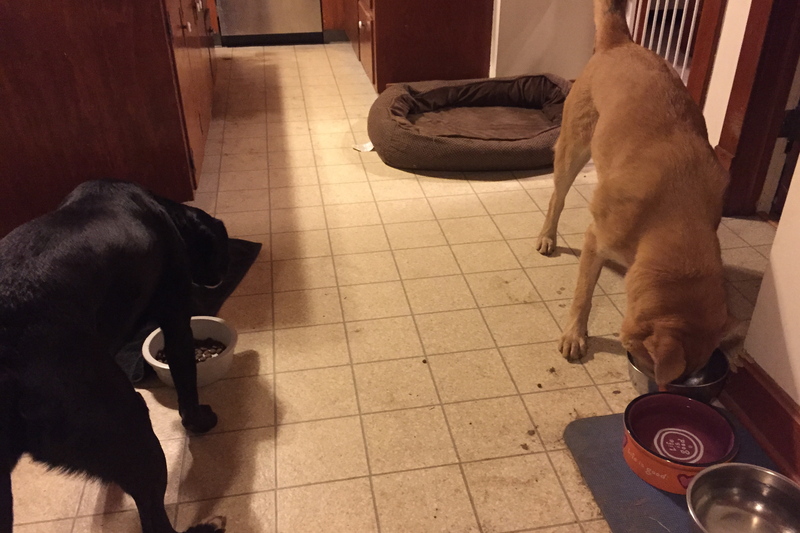 We talked to the kids about how housetraining would have to be a family commitment, and we’d all have to be willing to clean up messes. After several minutes, the volunteer started to take him back and bring us the next dog. As soon as she was out of the room, I looked at Alex and said, “Why are we even bothering? We love Biff, why not get him?” Everybody grinned and agreed and we chased after the lady taking our dog away. It was a fun ride home. Biff sat in the back with the kids, and they both kept exclaiming how cute he is. We’d saved some toys that Max didn’t use, so I pulled those out when we got home. I loved watching my son interact with Biff. 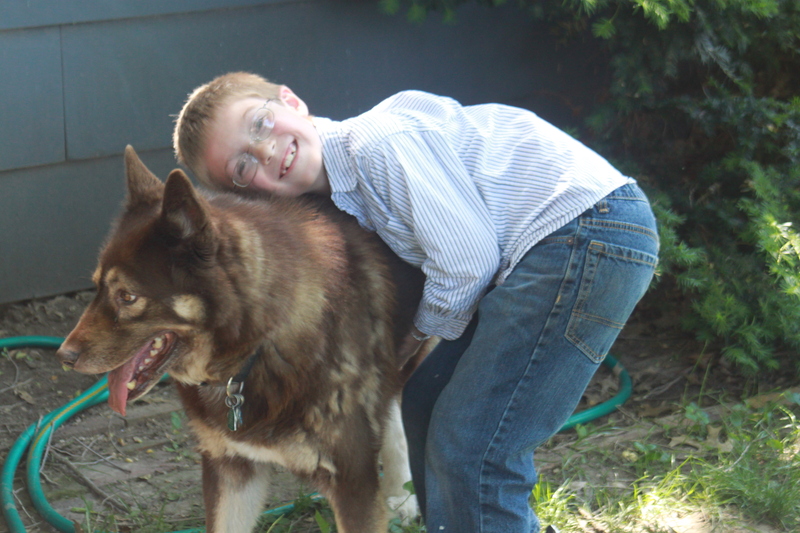 He’d been so tentative and cautious around Max that I loved that he was able to relax and just enjoy the dog’s company. We have now renamed him Captain Jack, after the character in Doctor Who, because the dog is cute and loves everyone. We’re all so happy to be a dog family again! And I’ll say it again, if you’re looking for a furry friend, check your local shelters first!